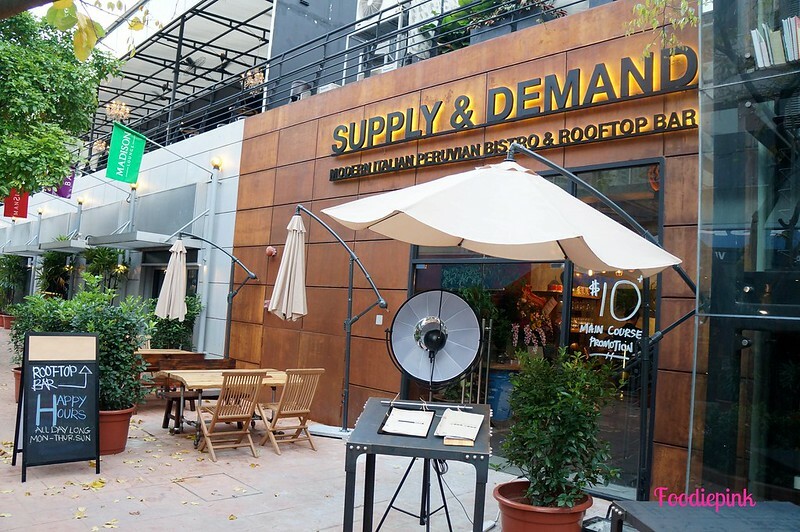 Supply & Demand is a month-old Italian-Peruvian restaurant, with an extremely cosy and cool rooftop bar that I was ushered to at the end of the meal. I took a quick look at the alcohol menu and beer lovers will be glad to know that a bottle can go as low as $5! To make things even better for you, Happy Hour is all day long, from Mondays to Thursdays and on Sundays. There was even a personal tent set up at one corner of the rooftop bar, complete with air-conditioning! 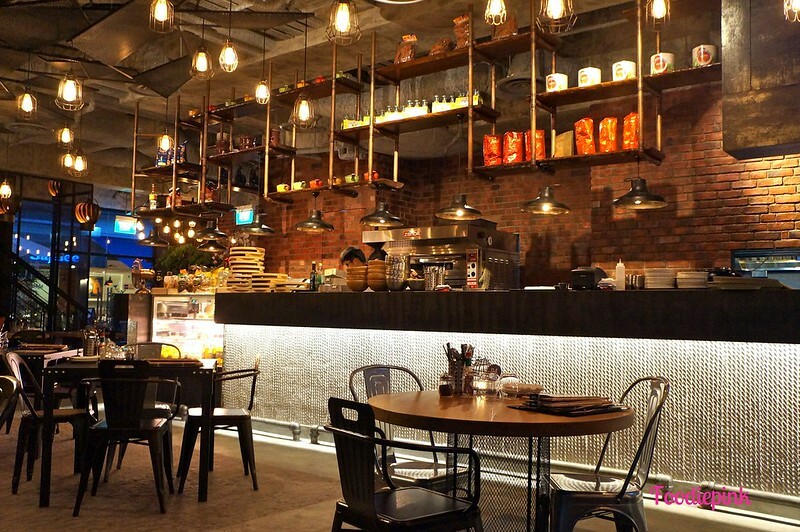 This brand new concept restaurant is a brainchild of 4 Singaporeans, all with strong backgrounds in the F&B industry. I was there during the first week of opening and I was impressed at how organised the management of the ground was and I was even served by one of the owners herself. I really appreciate the fact that she genuinely made sure all the diners were well taken care of. Thumbs up! This vibe that I love – overhead filament bulbs, brick walls, steel chairs and pipes. Couldn’t resist one more shot! As you can see, the space is huge, complete with alfresco seatings on the ground level. Beef ($29) – Have you ever had Omakase western-style? This was my first time too! Basically it works this way: order your choice of meat (beef, wagyu, lamb, chicken, pork or fish) and they will hit the grill and be “prepared differently daily”, with 2 side dishes “as per the whim of The Chef”. 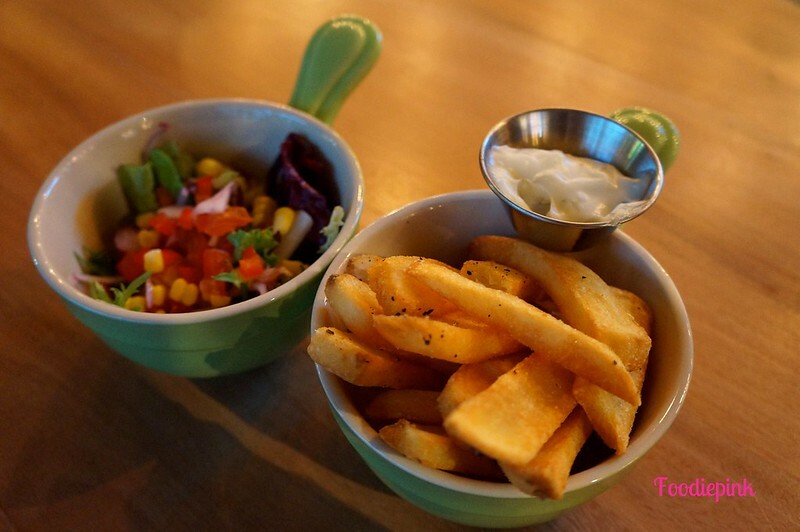 When the side dishes were served – a salad and thick-cut fries – I thought The Chef must had been lacking some creative juices that day. However, I was too quick to judge. The fries were one of the most addictive ones I’ve had yet! I’m usually not a fan of potato fries but these were coated with some spices which added an extra kick and they were the epitome of crispy-exterior-and-mushy-interior fries. 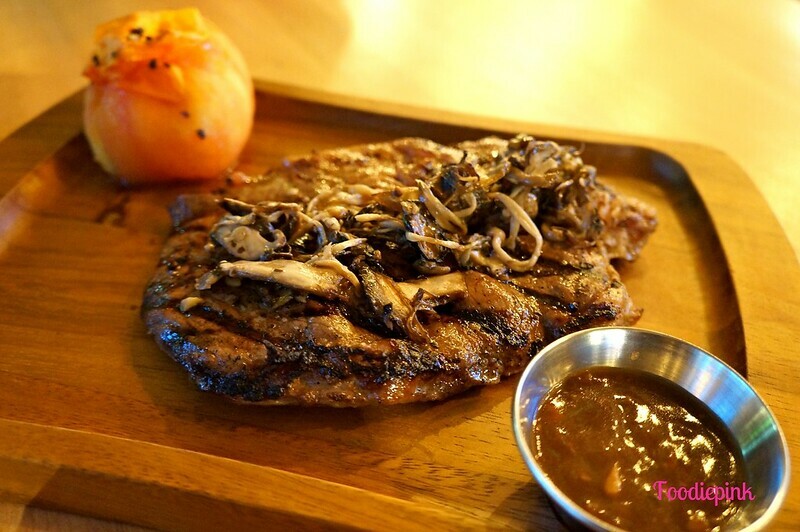 The beef looked even more palatable; it was topped with grilled mushrooms, tomato and red wine sauce! The sauce was an absolute winner and the tomato was bursting with juice. Overall, I really enjoyed this dish and I don’t mind having my meat done this way every time I’m here. That said, I’m sure Supply & Demand will be able to create and innovate many unique styles of preparation. Be ready to receive your surprise! 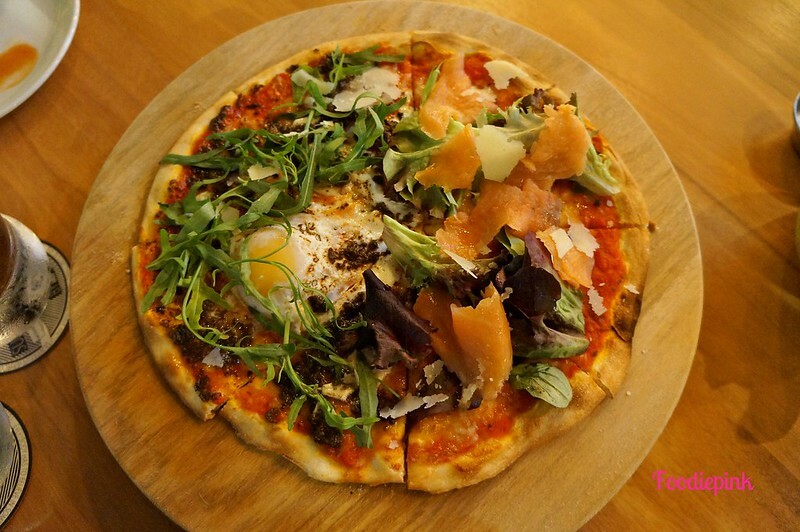 9″Pizza w 2 Flavours in 1 Pizza: Truffle & Egg/Smoked Salmon ($17+$3) – The pizzas at Supply & Demand come in two sizes – 9″ and 13″, priced at $17 and $21 respectively. If you’d like to have 2 flavours within a pizza or have it Calzone-style (curry-puff style), an additional $3 is charged. I personally felt that the pricing was very reasonable as the 9″ was actually good to share between 2 small eaters. The crust was thin yet chewy, with a good spread of tomato sauce. My vote goes to Truffle & Egg, I mean needless to say right? It was a genius idea to combine 2 of my favourites in a pizza. What’s more was that truffle paste was used instead of the usual truffle oil which made the expensive aroma and taste stronger. The egg was perfectly cooked as its core was still soft. 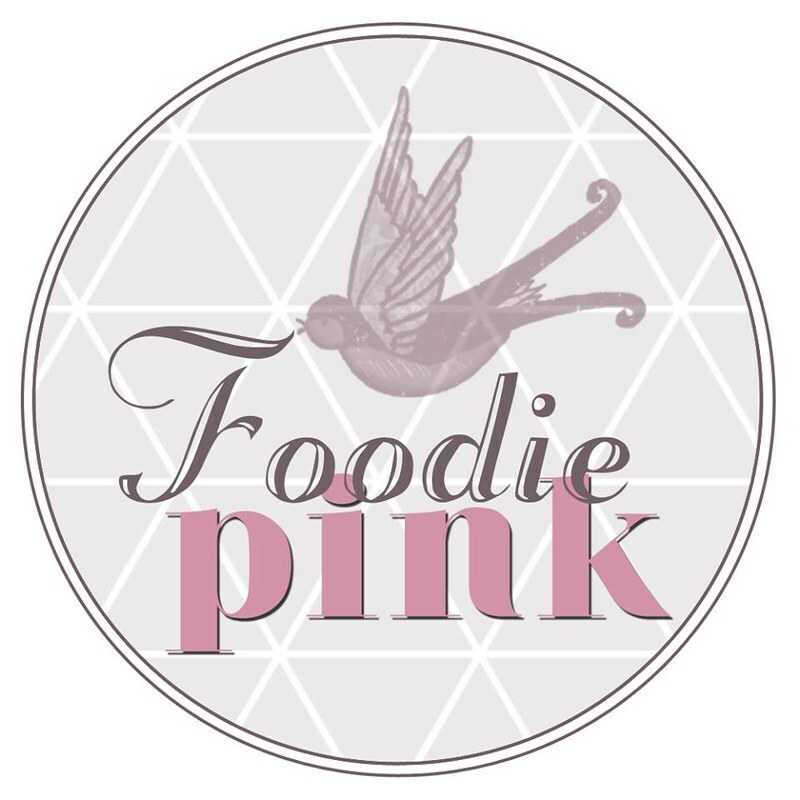 I would highly recommend their pizzas as it was really memorable and they have a substantial number of unique choices for you to choose from, such as Fig & Gorgonzola, Seared Beef and etc.! 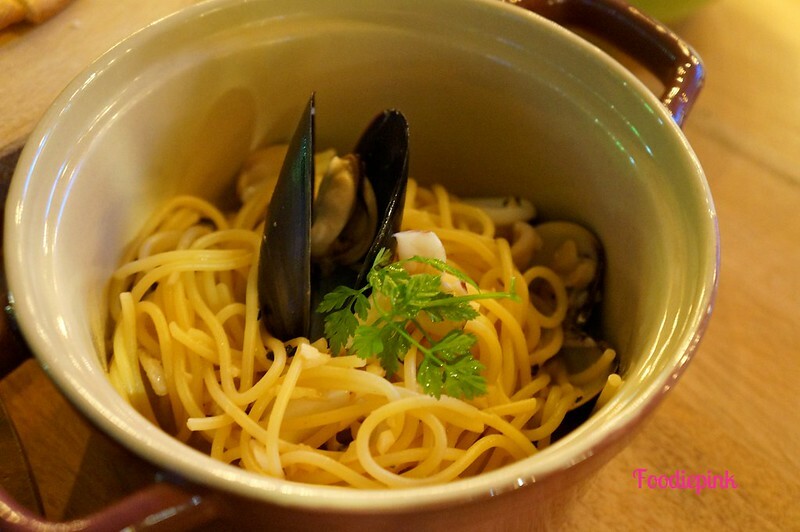 Vongole in a Garlic Infused White Wine Sauce (Tasting Portion: $15) – This dish paled in comparison to the former two. 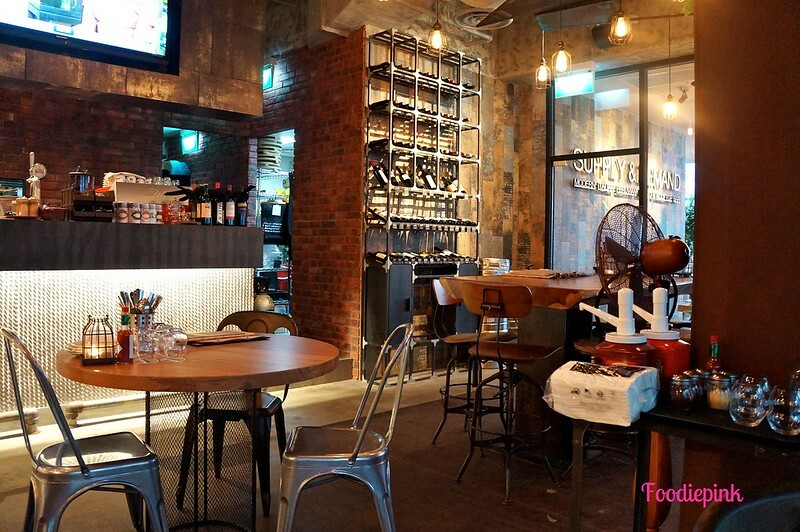 Supply & Demand is really my kind of ideal place for dinner with my loved ones. Even though it’s an Italian-Peruvian restaurant, there is more Italian influence than the latter, which also translates to higher acceptability amongst diners. Great place to unwind and make merry I would say! Now, you have a new place to check out this weekend!